Gumbymint is like a rabid dog attacking its owner. Rabid dogs should be put down. India, Japan, and Australia moving to embrace cryptos while the fascist pigs in the District of Corruption are working on a bill to criminalize it. while the fascist pigs in the District of Corruption are working on a bill to criminalize it. Are you saying there's actually a Bill in Congress that does that, or just that it's on their wish list? Trying to get 'mericans to out themselves by declaring their bitcoin net worth at the commie checkpoints seems more like an act of desperation than a real policy. Smacks of the traitor FDR declaring private gold ownership "illegal" and threatening fines and prison time that was never going to be used. Except, bitcoin is just a tiny bit easier to conceal. DeeCee is filled with pathetic leeches that couldn't survive a month on the streets. Thanks for posting that. Very interesting. Although I will say that I feel they are setting themselves up for an impossible task. (2) that includes an assessment of infrastructure needed to carry out the strategy detailed in paragraph (1). How could they ever actually do that? For example, in the case of prepaid gift cards, email the codes to yourself via a free email service and then shred the cards. Travel to wherever you want, check your email for the codes and spend 'em like normal. How could they ever have time to check for that at a border crossing? ...and even if the nsa spied on your email and tattled on ya, all ya gotta do is alter the codes by a known-only-to-you amount and/or add a few of your own characters to them so no one could know what they were. (an Amazon code on its own may be recognizable as such) Ie: At that point it's just a random string of numbers and letters. Mission impossible. They just want to scare people into screwing themselves...again. So far we have covered a few of the laws and policies government, in conjunction with the banking cabal have their sights set on our remaining wealth. We have also questioned the base architecture of the internet and shown how governments outside the U.S. have explored building an entirely new internet for the purpose of moving away from the U.S. centric internet. Anyone that doesn’t understand our entire digital footprint is captured and catalogued by government spy agencies is not living in the real world. This brings us to the fact several governments have expressed their desire to eliminate cash from the system. Sweden has moved away from cash in a non-official capacity. India recently eliminated the two most used bank notes in the country. China’s economy flourishes on approximately 40% cash transactions and we have also demonstrated the world over approximately 1 out of 3 people never use cash at all for any reason. What is behind a move to a cashless society? Who is interested in making this a reality? Who would benefit and what could possibly go wrong for the citizens? Williem Buiter, CITI, wrote an article for the Financial Times – Alphaville describing how what a wonderful world it would be without all that nasty cash floating around. Mr. Buiter is one of those economist that, at his core, seems to hate that people have a desire to save their wealth instead of spending their way into prosperity. As far back as 1999 Wiliem seemingly was already interested in stealing peoples wealth through “negative” interest rates. First, as Williem states, there is no such thing as negative interest rates. You and I would refer this as theft, but since Buiter is an “economist” of the highest degree he uses very flowery language. An economy is in a liquidity trap when monetary policy cannot influence either real or nominal variables of interest. A necessary condition for this is that the short nominal interest rate is constrained by its lower bound, typically zero. The paper considers two small analytical models, one Old-Keynesian, the other New-Keynesian possessing equilibria where not only the short nominal interest rate, but nominal interest rates at all maturities can be stuck at their zero lower bound. In other-words – if a bank can show that zero is not actually the end of the line for interest rates, the sky is the limit as to how low interest rates can go. This, of course, is dependent on imposing a “carry tax” on currency. Meaning, that if you have funds in a checking, savings or other account in a bank the bank MUST charge your a percentage of your funds for the privilege of them holding your funds. Just kinda gives you the warm and fuzzies doesn’t it? The fact that Buiter detailed how negative interest rates would work in 1999 proves beyond question we are given small pieces of the puzzle and it is our duty and our responsibility to piece the puzzle together. The banksters told us it was coming, they just didn’t say when. While the paper Buiter is public, Quantitate Easing (QE), Negative Interest Rate Policy (NIRP) and Zero Interest Rate Policy (ZIRP) were never introduced, across the spectrum, to the public until 2010 and this was two full years after the collapse of the banking system in 2008 and all the attempts to “revive the economy” had completely failed. The banks were still in a state of collapse after two years of trying to convince the public everything was fine. Now we have a better idea of why banks must move to a cashless society. If they do not, the way the system is currently functioning will never change. It will remain in a perpetual state of nothingness or said more plainly – economic depression – think Japan for the past 20+ years. The serfs will rise up if this continues much longer so having an escape plan is a must. That escape plan is a cashless society. I want something in our system to change and allow the people to have free will. Is the blockchain or cryptocurrencies the answer? Will we the people be able to force the hand of the central banks, the cause of misery the world over? Will we the people be able to take back our sovereignty without firing a shot? Let’s review some recent comments on the blockchain, cryptocurrencies and read what has been said. The first step in stripping all the cash from the hands of the people, and thereby, rendering them slaves to the banks forever, make it much simpler and “convenient” to use a debit or credit card and enact laws that limit their use of cash. If this doesn’t work simply change the laws outlawing cash, but the goal is to first soft-sell “de-cashing“. One of my favorite criminal banksters is Blythe Masters, the queen of derivatives. If ever there was a one single person responsible for the 2008 utter meltdown of the global economy it would be Masters. She is directly responsible for the development of credit default swaps – “financial weapons of mass destruction”. Blythe, after strip mining the global economy for the banksters accepted her next assignment – developing blockchain technology for the banking cabal. In 2015 Masters was being heralded as the second-coming in banking. What about something else associated with Blythe and her merry band of bankster scum – the DTCC. Not familiar with DTCC. Well, they own all the stock in your portfolio. Please, I beg you not to trust me and look it up yourself – once you arrive at the point that shows you that I am 100% correct allow the pain and sting to sink down into your bones. Then do something about it. DTCC and Digital Asset – the tech firm that Masters leads – hope that their new tool will cut costs for traders, and reduce the risk that trades won’t complete correctly. Isn’t that nice, Blythe Masters building blockchain technology to assist the banks and the DTCC to make everything run better. That is about as terrifying a thought as I can imagine. I feel confident the efficiencies in theft by the banks will increase 10-fold. What about the next level up from Blythe and her criminality? The IMF is also interested in blockchain and cryptocurrencies. Plenary, plenary, where have I heard that word before – oh yeah, in John Titus’ brilliant explanation All the Plenary’s Men.The picture gets darker and uglier by the minute. What about the federal government of the U.S. what interest are the wankers in DC showing? For those unaware DLT another way of saying blockchain. That’s a lot of criminals circling the very item that is suppose to free humanity from the clutches of these very people that have us currently enslaved!! Or did I miss something? What the central banks? Well, they already have a cryptocurrency to circumvent all the other cryptocurrencies. I want out of this current nightmare as much as anyone else. I have long questioned the “saving grace” of cryptocurrencies and said point blank this is a banksters dream come true. Now you have credible people singing the praises of this new technology. What about recent comments made by one these respected voices stating the technology can be traced “step for step” with a “paper trail” leading back to the ultimate source of the recent Ethereum flash crash!! Listen for yourself, then get back to me about how this technology, now surrounded by the very criminals, who’s crimes we report every single day, like jackals surrounding it’s next victim. At the end of the day each of us has to make decisions based on information and our individual circumstances. 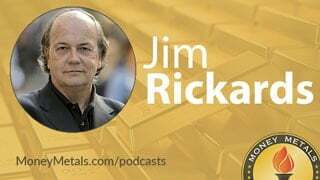 I am still stacking physical gold and silver. I will continue stacking physical. Brace yourself, coming soon, to a bank account near YOU !!! If by "Brace" you mean lock & load...then I'm ready. Quite possible. Lets wait for the election results from The state of Uttarpradesh. It's quite possible the havenots think that Mr Modi is their champion. Suddenly a lot of rich and powerful people have lost more than them with demonetization. The ruling BJP party won in uttarpradesh elections defeating the yadavs. However people have started questioning the validity of elections and EVM. Just to be clear: This is NOT fāke™ news. It is an article from The Economist published 29 years and six months ago, today. This week the International Monetary Fund shocked some economic analysts with an announcement that America was “no longer first in the world” as a major economic growth engine. This stinging assertion falls exactly in line with the narrative out of the latest G20 summit; that the U.S. is fading away leaving the door open for countries like Germany and China to join forces and fill the power void. I wrote about this rising relationship between these two nations as well as the ongoing controlled demolition of America’s economy in my article ‘The New World Order Will Begin With Germany And China’. I find it interesting that the IMF is once again taking the lead on perpetuating the image of a failing U.S., just as they often push for the concept of a single global currency system to replace the dollar as the world reserve. The most common faulty counter-argument I run into when outlining the globalist agenda to supplant the dollar with the Special Drawing Rights basket system is that “the IMF is a U.S. government controlled organization that would never undermine U.S. authority.” Obviously, the people who make this argument have been thoroughly duped. To illustrate how the IMF narrative supports the globalist narrative, I suggest comparing the 2009 “predictions” of George Soros on China replacing the U.S. as the world’s economic engine to the IMF’s latest analysis on the decline of America. The IMF cares only about centralizing everything, from currency to trade to governance. If the sacrifice of the old world system (the U.S. dollar) is required to create their new world system, then that is what they will do. If you have read my article ‘The Federal Reserve Is A Saboteur — And The “Experts” Are Oblivious’, then you understand that the Fed is also perfectly on board with this plan for a global reset. The central bankers, regardless of the nation they happen to reside, stick together and function as agents of larger controlling organisms like the Bank for International Settlements. The agenda is not really veiled in secrecy, as it has been openly admitted to on numerous occasions by globalist media outlets. Mohamed El-Erian, former CEO of PIMCO, recently praised the concept of using the IMF SDR as a world currency mechanism and as a means to combat “the rise of populism.” However, the most “honest” of these incidences of admission was, of course, the article Get Ready For The Phoenix published in the Rothschild controlled magazine The Economist in 1988; an article which announced the beginning of a new global currency mechanism using the SDR as a bridge starting in 2018. I have noticed in the past month that there has been a concerted disinformation campaign on the internet attempting to debunk the article from The Economist by stating that it “never really existed” and is merely a product of conspiracy websites. So, I will put that claim to rest right now, permanently, by pointing out that magazine and research archives completely unrelated to “conspiracy theory” have the Phoenix issue on record. It is undeniable — the article was indeed published by The Economist and does in fact exist. The fact is, it already exists, and it is right under their noses. When The Economist wrote about a global currency being launched in 2018, they perhaps did not have a precise inkling back then on how it would come about. They do mention clearly the strategy of using the IMF’s SDR as a stepping stone to that global currency, calling it the “Phoenix,” as an example. They also mention the decline of the U.S. as being necessary in the wake of this shift into complete centralization. These two events are taking place right now, with the American economy in steady and ever steeper destabilization, as well as the rise of the SDR basket as a “stopgap” for nations seeking to decouple from the dollar as the world reserve. But what about the currency itself? The SDR might be the framework that will reign in various nations under one nefarious economic umbrella, allowing the IMF to dictate currency exchange rates at will until their one world system can be established, but what will the average person ultimately be using as a unit of trade and how will the globalists maintain monetary subjugation over the public? Cryptocurrency and the creation of blockchain technology is the answer. 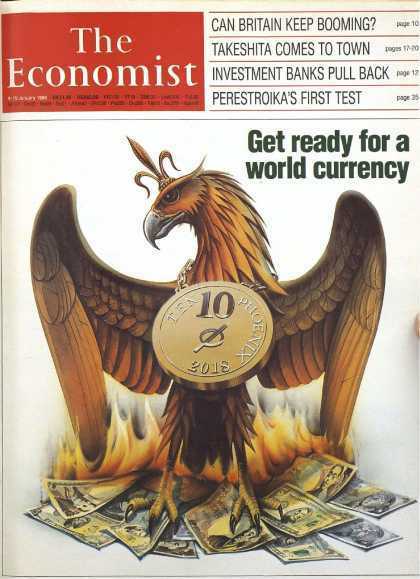 When The Economist wrote about a global currency being initiated in 2018, they were not making a prediction, but a proclamation — a self fulfilling prophecy. This does not mean that the new currency will develop in an obvious and open way. In reality, I can’t think of very many 4th generation psy-ops as clever as cryptocurrencies. Consider this; after 2007/2008, the weakness of globalism and economic interdependency is exposed for all the world to see. It is a sacrifice the international banks are willing to make, because through the credit and derivatives crash they can now enforce extreme monetary policies. These policies will do nothing to save the general economy, but they will jeopardize the very currency and debt frameworks of some nations, including the U.S. The stage is set for a new and even greater crisis, a crisis which will soften the public to the idea of a single world monetary system and a single economic authority. The massive flow of data which the globalists covet as a means of “total information awareness” is a double-edged sword. Sovereignty and liberty activists grow in awareness and in number and influence. Millions begin preparing to weather the potential crisis being engineered by the globalists. Methods of counteracting an economic downturn or currency implosion are fielded. Activists start bartering and buying up precious metals as a shield, and as an alternative unit of trade. The alternative market, at least the core of it, is born. What is a power hungry cabal to do? How do they stop the natural progression of the revolution against them? Well, they don’t stop it; instead, they attempt to redirect it to work for them. That is to say, they trick the liberty movement into helping them while letting us think we are poking them in the eye. Enter cryptocurrencies like bitcoin. Bitcoin arrives seemingly from nowhere, conjured by a magical crypto-wizard by the name of Satoshi Nakamoto, a label supposed to represent a person or group of people that no one has ever seen or heard from. We are simply meant to have faith that they don’t work for the NSA or a similar entity. But who cares who they are, right!? It doesn’t matter because bitcoin is such a work of art it is nearly infallible — the perfect countermeasure to a monetary world lorded over by the dollar and the Federal Reserve. Some of us are unconvinced, and even rather suspicious, and with good reason. For example, the advancement of cryptocurrencies into mainstream consciousness has been helped expertly by the corporate media, which frankly, does not make sense if they are a real threat to the central banking monolith. As they say, when the real revolution happens, it will not be televised. Bitcoin is televised everywhere. On top of this, nearly all major international banks are ingraining blockchain tech and cryptocurrencies into their business models, including globalist foundation banks like Goldman Sachs. Goldman Sachs LOVES blockchain technology; they even refer to it as the “new technology of trust.” Just take a look at their rave reviews on how it will change the world here. The early promise of anonymity in cryptocurrencies was a lie. Thus, we have the reason why central bankers and international financial conglomerates are piling into bitcoin like it’s the hottest tech stock on the Nasdaq. Imagine a trade system in which every single transaction is compiled and nothing is private; that is the blockchain. Now, anonymity might not matter much when you are dealing with regular people, but what about when you are dealing with governments with the tendency towards corruption and the power to imprison and confiscate? The loss of all privacy in trade IS the next quantum leap in monetary centralization, and cryptocurrencies achieve this in spectacular fashion. Not only this, but complete loss of privacy becomes rationalized, because without “transparency” the blockchain does not properly function. This is what makes the blockchain different from all other digital trade mechanisms – with the blockchain, surveillance of transactions is no longer a violation of privacy rights, it is expected. While there is something to be said for crypto and its potential to limit fiat money, I still remain skeptical. Mainly because anyone can create a cryptocurrency out of thin air. Just look at the confusion building over bitcoin vs. ethereum; which tulip is worth more, everyone wonders? Being that crypto is not tangible and is completely based on perceived value according to perceived demand rather than real demand, I think it is fair to argue that cryptocurrencies rely entirely on hype and fad in order to maintain market strength. Not that regular fiat currencies are any better, but isn’t that the point? So where does it end? If ethereum replaces bitcoin like Facebook replaced MySpace, how is stability in any digital currency provided? Through the force of government and the backing of international banks, obviously. And whichever cryptocurrency system the bankers choose to back or create, that currency will destroy the value of all other crypto around it. Again, perception, not tangible value, rules over bitcoin and its peers, and institutional power often rules over perception. The proclamations of The Economist of a world currency launch by 2018 are happening today, right on schedule, right in front of us. The blockchain is going to “change the world;” this has been excitedly announced by the very same banking elites the blockchain was supposedly engineered to defeat. When the next reserve currency system is established using the SDR basket as a foundation, I have no doubt it will be digital and based on the same exact tech that today’s activists wrongly assume will set them free. Dropped off the wife at the airport for a 6 am flight. Parked in short term parking to ferry her & luggage inside. When I went to exit, I dug out a 10 spot to pay the 4 bucks for the 1 hour. The human manned take all forms of payment booth was closed. I still see toll takers at airports. They are on doom alert. Probably no more than two years from being eliminated completely. Might as well be one of those elevator operators in a dept. store like when I was a kid. Technology plus minimum wage hikes not conducive to the economy. Walmart instituted self checkout a couple of years ago. First a chasm of suspicion from customers coupled with poorly functioning equipment. Got their bugs worked out. Was in there the other day. A good majority of people are now 'trained' to do their own checkout. Pretty much the same equipment either way but minus paying someone else to run them. Robots are are the other part. They work 24/7, don't take breaks or vacation, don't snivel some problem to hr, don't get accused of sexual harassment, don't need benefits or social security,etc. The worker is becoming obsolete or will be in many fields. For example, when Alipay hit the Chinese market with its instant mobile app pay features, it was an overnight sensation. Now, it’s conducting a massive $1.7 trillion in business annually in China. In short, GlancePay (CSE:GET) has apps that can simply take a glance at where you are… using proprietary and patented GPS / micro-location and image identification technology… and pays your merchant…in seconds. The app knows where you are using patented GPS technology. And, if GPS isn’t available, it can even determine your location using a photo of where you are. Much like Google has mapped the world… GlancePay has quietly built a proprietary global database of locations. With GlancePay, you’re not just paying a bill: The system includes in-app marketing, in-store rewards, transaction history, payment confirmation, and even the ability to split the tab in a restaurant. It incentivizes users… and adoption is picking up from this network effect. Legal Disclaimer/Disclosure: This piece is an advertorial and has been paid for. This document is not and should not be construed as an offer to sell or the solicitation of an offer to purchase or subscribe for any investment. No information in this Report should be construed as individualized investment advice. A licensed financial advisor should be consulted prior to making any investment decision. We make no guarantee, representation or warranty and accept no responsibility or liability as to its accuracy or completeness. Expressions of opinion are those of Safehaven.com only and are subject to change without notice. Safehaven.com assumes no warranty, liability or guarantee for the current relevance, correctness or completeness of any information provided within this Report and will not be held liable for the consequence of reliance upon any opinion or statement contained herein or any omission. Furthermore, we assume no liability for any direct or indirect loss or damage or, in particular, for lost profit, which you may incur as a result of the use and existence of the information, provided within this Report. SHTFplan Legal Notice: The content in this article is provided by SHTFplan.com as general information only. The ideas expressed herein are solely the opinions of the author(s) and do not necessarily represent the opinions of sponsors or firms affiliated with the author(s). Members of the SHTFplan.com staff and/or owners of SHTFplan.com currently own no shares in the company mentioned. We will not purchase shares in the next 30 days. SHTFplan.com has been compensated for a two week marketing campaign. We were paid directly by SafeHaven.com, a third party media company who works directly with Glancepay. Any action taken as a result of information, analysis, or advertisement on this site is ultimately the responsibility of the reader. The information herein is not intended to be personal legal or investment advice and may not be appropriate or applicable for all readers. If personal advice is needed, the services of a qualified legal, investment or tax professional should be sought. Never base any decision on a single email. The companies mentioned in this post are intended to be a stock ideas, NOT recommendations. The ideas we present are high risk and you can lose your entire investment. We are not stock pickers, market timers, investment advisers, and you should not base any investment decision on our website, emails, videos, or other published material. Please do your own research before investing. It is crucial that you at least look at current SEC filings and read the latest press releases. Information contained in this profile was extracted from current documents filed with the SEC, the company web site and other publicly available sources deemed reliable. Our report is not intended to be, nor should it be construed as an offer to buy or sell, or a solicitation of an offer to buy or sell securities, or as a recommendation to purchase anything. This publication may provide the addresses or contain hyperlinks to websites; we disclaim any responsibility for the content of any such other websites. So what happens if you don't want to pay for Iphone service? Russia Backpedals On Bitcoin - Unveils Plan To Ban Cryptocurrency Sales To "Ordinary People"
After local Russian media reported earlier this year that the Russian Parliament could legalize bitcoin as soon as 2018, Deputy Finance Minister Alexei Moiseev this week signaled that authorities might instead seek to restrict its use. During an interview with Russia 24, a state-owned news channel, Moiseev said that Russian authorities should treat cryptocurrencies, including bitcoin, as sophisticated financial assets and restrict their use and trading to qualified investors only. Moiseev’s statement surprised members of Russia's digital currency community, who had been lead to believe that the Russian government was finally warming to digital currencies after years of skepticism. That belief was strengthened earlier this month when an aide to Vladimir Putin announced that he would seek to raise $100 million to build bitcoin mining infrastructure in Russia, with the goal of controlling as much as 30% of the bitcoin network’s hashpower. As a regulated financial security, Moiseev said cryptocurrencies would be sold through stock exchanges under the supervision of the Federal Financial Monitoring Service of the Russian Federation, also known as Rosfinmonitoring, according to Bitcoin Magazine. Moiseev added that bitcoin is a "dangerous" investment, and that it's the government's duty to protect "ordinary people" from losing their shirts, according to CoinTelegraph. Moiseev detailed that this approach to cryptocurrency regulation aims to protect the rights of buyers and sellers. “Now people do it at their own peril and risk, they have no judicial protection. This is our first task,” he was quoted by Vedomosti. His comments then turned to the subject of money laundering. Finally, Moiseev said that the Russian government is uncomfortable with the anonymity provided by bitcoin. What's worse for bitcoiners is that Russia might be at the vanguard of a shift in how authorities view bitcoin. The SEC late last monthdeclared that digital currencies, including bitcoin and the tokens issued during ICOs, should be treated as securities under the law. So far, the SEC's guidance has been vague. But the ease with which digital currencies could be used to finance illicit activities – regardless of whether they’re actually being used for that purpose – likely means that more government crackdowns are ahead. By requiring all local bitcoin exchanges to screen transactions for potential violations, China has found a way to pierce the anonymity surrounding digital-currency transactions. Don’t think it can't happen in the US. Riksbank, Sweden’s central bank, is taking a serious look at Bitcoin. As cash use plummets and the amount of currency in circulation dwindles, central banks are looking to cryptocurrencies as government-backed money. Riksbank estimates that cash transactions made up only 15 percent of all retail transactions last year. That number is down from 40 percent in 2010, thanks in large part to massively popular mobile payment services. That leaves the bank wondering if a technology similar to that of Bitcoin’s could be implemented in Sweden. Government bankers across the world believe this has the potential to replace cash and make other payment systems more efficient. Riksbank is investigating not only distributed-ledger technology (which it describes as unproven yet “progressing incredibly rapidly”) but also traditional, centralized accounting methods for its “e-krona” (pdf) project. Many central banks are looking into this type of currency, but Sweden appears to be at the forefront of the movement. China’s central bank has also begun testing of a digital currency. Speeches and research papers from officials at the People’s Bank of China show that the bank’s strategy is to introduce the digital currency alongside China’s renminbi. But there is currently no timetable for this, and the bank seems to be proceeding cautiously. But the main issue for governments is that they are losing their grip and control on currency. Sweden’s dwindling cash usage is increasing reliance on mobile payment systems risks marginalizing people who don’t use them or can’t access them. Those systems are also run by private companies, which means that commercial forces, rather than government policies, could end up determining how effectively the financial system serves people and the economy. Clueless kids and their ideas of Cashless sales. A HUGE number of people in the US don't have "Smart Phones". Until every person in the US has access to a wireless device for FREE ther'll be cash to use for purchases. Regardless of whether not everyone has a smartphone (they won't, not ever) there will be cash. Period. 100 years from now even. Many of the adults I know, only use plastic for transactions . I have 1 friend who is around 55 and has owned his own diesel repair biz for decades. His average salary is $500,000 - $750,000 per year and he never carries cash with him . I was in Walmart once, and he was in the same checkout line I was in. He stopped in there to buy a candy bar and some gum. He paid with a credit card. I have no idea why people continue to do this,. especially with all the credit hacking happening. Now SONIC fast food got hacked the other day, and millions more people had their credit card info compromised. Its almost like humans are oblivious to the negative ramifications of their actions. there will be cash. Period. 100 years from now even. I doubt that. The growing trends seem to indicate a future of cashless societies . Maybe TPTB will still use some forms of physical cash, so they can hide their backdoor deals and malfeasance. Digital currency would be another nail in the coffin of freedom for society, and yet most people will accept it. As it is now, a significant percentage of Americans pay with plastic/credit and many places wont accept cash or bills larger then $20 . This trend is not gonna stop . Spent most of Monday out running errands. No matter where I went it was plastic not cash being used. Actually didn't see anyone use cash. At HomeDeepshits 2 of the 4 auto pay machines do not accept cash soon to be all 4. When that happens cash will only be accepted by the purposely placed semi retarded check out person with the long line. As witnessed recently, no electricity or communications, no sales. Cash can be cumbersome when doing business. All the accounting is done right at the time of transaction. There was a time the lumber yard would write out slips for every sale. Sometimes but rarely they still do if there is a glitch. They will even e-mail your receipts daily now. As for the theft, how much easier is it for an employee to slip a five spot in his pocket as opposed to a hack? All plastic - no cash. At happy hour saw peeps buying others a drink so they could hit the $10 minimum to use plastic. Happens a lot with peeps who are on the move. Also saw a lot of peeps paying for and playing music on their phones. Hardly see anyone using cash any more. Hacker theft thru credit infiltration affects millions of people via 1 intrusion. A employee that steals a 10 bill of cash , is not nearly as devastating and that employee can much easily be caught, then the offshore hackers that use digital encryption to steal billions of dollars and personal information of other people . All digital currency will be 1 of the worst things to enslave the human race and increase our tax burdens.